This is Bijou - he had a pretty tough life (the picture definitely speaks volumes). Thankfully a wonderful person stepped in to help him. This is Bijou - yes - this is Bijou. The trantsformation is amazing. 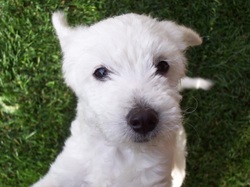 Karen's family includes this little gem & he is part of the inspiration for MexPup. 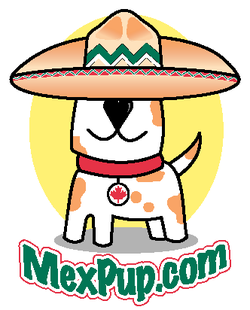 Mexpup was born from “what now?”, “what can I do?” and “I need help!”. People saw hurt, frightened and homeless dogs that needed help in Puerto Vallarta and made the decision to stop, protect those animals and make a difference. It all started with Riley the Poodle. 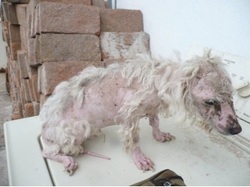 Skinny, scared, covered in fleas, filthy and trembling, he saw two healthy dogs being walked by their owner and hesitantly began to follow them hoping with all his heart that the nice lady could help him. She did. It was just an effort to help a dog in need and it was her first rescue. The next dog was Domino and a pattern was started. There were dogs, they needed help and people had the chance to do something for them. Then came a very special little puppy named Miau. Miau was rescued by the Purr Project where she spent the first two weeks of her rescue life as the only dog (puppy) surrounded by more than 200 cats! The people at Purr Project are dedicated to helping cats, but animal lovers are animal lovers and when they saw a puppy right in front of their door who needed to be saved, they couldn't say no. That little puppy was what ultimately brought all of us behind MexPup together. Enter some wonderful people from Victoria, British Columbia. They have huge hearts with the willingness to foster and place dogs with forever homes. A home where these previously discarded animals would be loved, cared for and treated well. The MexPup Canada team meets our Guardian Angels at the airport, no matter the hour, and after the introductions, hugs and tail wagging are all done they take the puppies to their last way-station on the road to their permanent home. Then, after being homeless, rescued, nursed back to health, fixed, socialized, fostered, chaperoned, fostered again and introduced... MexPup's work is done. 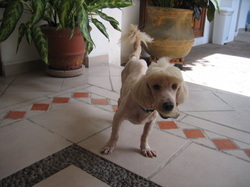 A once homeless dog from the streets of Mexico, has a brand new family, new home and a new start. This is what everything that all of the people who volunteered were working towards. Now it's time to do it all over again with another homeless MexPup and another wonderful new family. Everyone who works for, volunteers with or supports MexPup shares a bond created by a shared empathy for the homeless dogs of Mexico. That communal connection to animals is what drives our mission to serve the best interests of the homeless animal community in Puerto Vallarta. MexPup helps people help dogs. We make a difference. With your help we can do even more.